This bridge spanning the gorge of the River Ruel carries the access-road from the A886 highway to Dunans House, home of the Fletcher family since the 18th century. The house itself was rebuilt in baronial style c.l880 (en.1*), but the bridge bears the date 1815 and the initials of John Fletcher (d.l822). The bridge, which is built of local schist rubble with a sandstone coping, is 16.3m in overall height, and the level roadway is 28m in length and 5.4m in width within 0.5m parapets. It comprises three tall two-centred arches, the middle one spanning the river and the others carrying the approaches above the steep banks of the gorge. The central arch, which has centering-sockets below springing-level, is7.85m in span and 13.3m in height, and the side-arches are3.7m in span. All three arches spring from octagonal abutment-piers, decorated with blind slits, which project into the roadway. The arch-springings are marked by projecting impost-bands, returned along the arch-soffits, and similar bands mark the bases of the parapets. On each side the parapet is stepped up at the centre to enclose a sandstone panel bearing the initials JF, and in the N panel the date 1815, and below these panels there are drain-spouts, that to the Sin the form of a human gargoyle, while the other arches have corresponding spouts. A winding path downstream on the W bank gives a view of the bridge, which was improved by two artificial cascades. 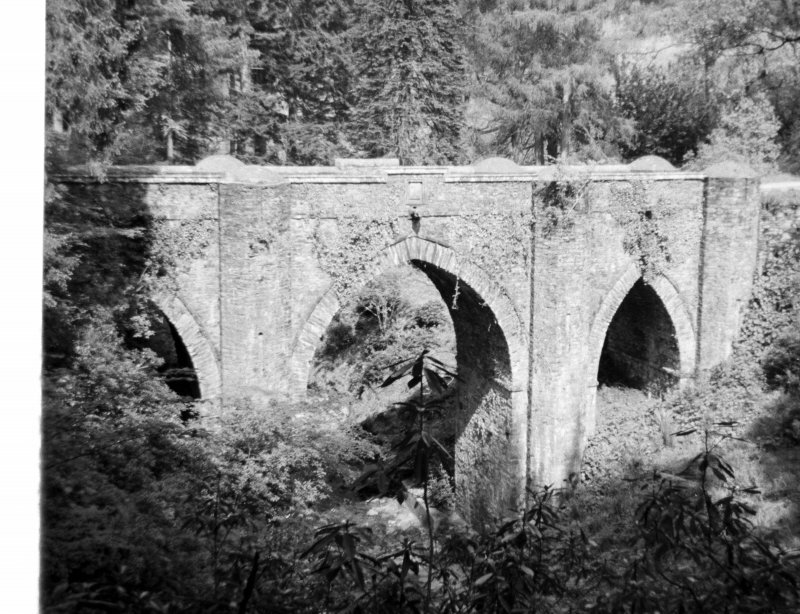 Remarkable Gothic three-arched bridge, 16m high (probably highest in Argyll), built 1815 to carry private road to Fletcher of Dunan's mansion above River Ruel.